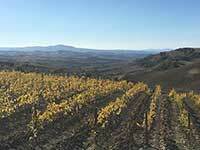 Montalcino is situated high on a hill, between the Brunello vineyards. The impressive castle or Fortezza, which was built by the Sienese in 1361, dominates this well-preserved medieval town. The town takes its name from il leccio or holm oak, a variety of oak tree that once covered the terrain. The very high site of the town offers stunning views over the Asso, Ombrone and Arbia valleys of Tuscany, dotted with silvery olive orchards, vineyards, fields, and villages. The lower slopes of the Montalcino hill itself are dominated by highly productive vines and olive orchards. The historic center of Montalcino has been pedestrianized, so it is a pleasant place to stroll around or linger over at a café on the square and practice your Italian with the locals. Parking is easy on Via Pietra Strozzi (Parcheggio Viale Strozzi). At the end of Via Pietra Strozzi is the Chiesa della Madonna del Soccorso. 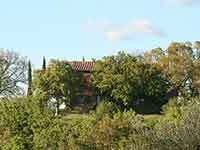 Behind the church, there is a small square offering a marvelous view over the Val d’Arbia in the direction of Siena. Montalcino is situated in the heart of Val d’Orcia in a postcard-like scenery. The city is part of the Val d’Orcia, a part of southern Tuscany characterized by gentle hills, sinuous country roads or strade bianche, and a horizon dotted with isolated cypress trees. The entire valley of the Val d'Orcia with this magnificent natural scenery was added to the UNESCO World Heritage list in 2006. The main square of Montalcino is Piazza del Popolo, situated down the hill from the fortress and Duomo on the via Matteotti. The principal building on the piazza is the former Palazzo dei Priori or Palazzo Comunale (built late 13th, early 14th century), now town hall. The palace is adorned with the heraldic coats of arms of the Podesta, once rulers of the city. A tall medieval tower is incorporated into the palazzo and dominates the square. Opposite the Palazzo Comunale or town hall is a beautiful Renaissance-style building with six round arches, called La Loggia, for which construction began at the very end of the 14th century and finished in the early 15th, but which has undergone much restoration work over the subsequent centuries. On the other side of the square is a beautiful terrace. It belongs to Caffè Fiaschetteria Italiana, where locals and regular visitors meet each other in the morning while enjoying an espresso or cappuccino. The prices are terribly high. The church and adjacent convent were erected by the Augustinian order in 1227. The church was rebuilt in Gothic style in 1380. The Civic and Dioceses Museum (Museo Civico e Diocesano d’Arte Sacra) is housed in the adjacent convent of the church since ... The museum housesone of the most important collections of medieval art in the province of Siena, with work by Duccio di Buoninsegna, Pietro and Ambrogio Lorenzetti, Sano di Pietro, Luca di Tommè, Bartolo di Fredi, Vincenzo Tamagni, Marco Pino (pupil of Beccafumi), Giovanni Pisano, Giovanni d'Agostino, Simone Martini and Francesco di Valdambrino. Highlight in the collection is Bartolo di Fredi's virtuoso and complex polyptych, L'incoronazione della Vergine (1388). The museum also displays a fine collection of painted wood sculptures, such as a small crucifix by Giovanni d'Agostino and a sublime Madonna by Domenico di Agostino. The Madonna or Santa Maria del Soccorso Sanctuary is located at Via Spagni in Montalcino. The church was erected across the centuries and thus erected in multiple styles, including a renaissance layout, baroque interiors, and an impressive neoclassical facade. Behind the church you can enjoy a breathtaking view over the hills of the Val d'Orcia. Among the local traditions we especially know the Sagra del Tordo (Festival of the Thrush), a folk festival and a grand archery competition held on the last Sunday of October among the four districts of Montalcino, Borghetto, Pianello, Ruga and Travaglio. Then let's not forget the gastronomic delights that made Tuscany famous across the world. Each region offers unique dishes based on its long history and location, and exploring the culture of Tuscan gastronomy should be part of your trip in Montalcino and the Val d’Orcia. According to Robert Louis Stevenson, wine is bottled poetry. This is what you experience in Montalcino.Together with Barolo and the Supertuscans, Brunello di Montalcino is today regarded as one of the greatest Italian wines. The wine is made from 100% Sangiovese grosso (formerly the grape was also called Brunello). Even though wine-growing has been practiced here for many centuries, the birth of the Brunello di Montalcino dates back to the second half of the 19th century. The real breakthrough came even in 1967 when winegrowers from Montalcino founded the Consorzio del Vino Brunello di Montalcino. In the same year, Brunello di Montalcino was the seventh wine to obtain the protected designation DOC in Italy. And in 1980 the wine was given the status of the DOCG quality mark. This stands for Denominazione di Origine Controllata e Garantita, and is the highest quality standard for wine in Italy. In the heart of the city, you can find some pleasant enoteca or wineries. The wine estates outside the city are also easy to visit and organize tastings and tours of the domain. It’s appropriate to make reservations for a tasting or a tour at most wineries, so contact them a few days in advance. Enoteca Di Piazza WINE ROOM Of Fedolfi Andrea s.a.s. There are good restaurants in Montalcino. 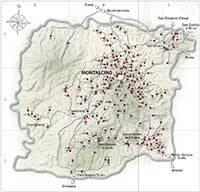 The best restaurants are located outside the city in Sant'Angelo in Colle and Sant'Angelo Scalo, frazioni or boroughs of Montalcino. A good selection of restaurants can be found here. Classic Tuscan cuisine in the heart of Montalcino. Real Italian atmosphere, some of the best dishes of Tuscan and Roman cuisine. The best off track address. Via Grossetana, 8 | Sant'Angelo Scalo, 53024, Montalcino. The road from Montalcino to San Quirico d'Orcia is particularly noteworthy for the bunch of cypress trees on your right, and between San Quirico d'Orcia and Pienza along SS146, where you can admire the Madonna di Vitaleta Chapel, 2 km outside San Quirico.